Well, it's wonderful as it is now, I can't imagine the final version. and with WM player I obtain nothing too. What codec do you use? ..... What codec do you use? It's small, 9 Mb, but reads almost everything. Fenerit, if you want, try XP Codec Pack 2.2.0, IMHO it can solve the problem, and moreover it's freeware. Thanks Andrea for the link. I've installed it and MPC doesn't not work again. Just VLC works (not so small indeed, with 32Mb on disk ). Nevertheless, it's astounding. I can't wait to see the complexity of the relevant .SSC. For curiosity (do not beat me): is leaved to the .CELX the control of camera's flyby around the scene, or have you planned an unique prospective's path? ...For curiosity (do not beat me): is leaved to the .CELX the control of camera's flyby around the scene, or have you planned an unique prospective's path? This is not yet defined... But I suppose the camera will follow the action from a distance, then the user will be free to zoom and rotate? Now in just in case ... if someone is able to write the camera movement, YOU ARE WELCOME! What's supposed to be so complicated about splines? You find the simple formulae and the special properties of splines in many places. This can easily be learned. ...What's supposed to be so complicated about splines? You find the simple formulae and the special properties of splines in many places. This can easily be learned. Well one must first define several points all around the models by which must pass the spline, define a couple of more points to define the speed during the travelling, then also define for each point where is targeting the camera. All this relative to one (or more) model to follow it during his own trajectory. Pure maths... unfortunately in my case, that's not really my cup of tea! Chris, you will kill me. 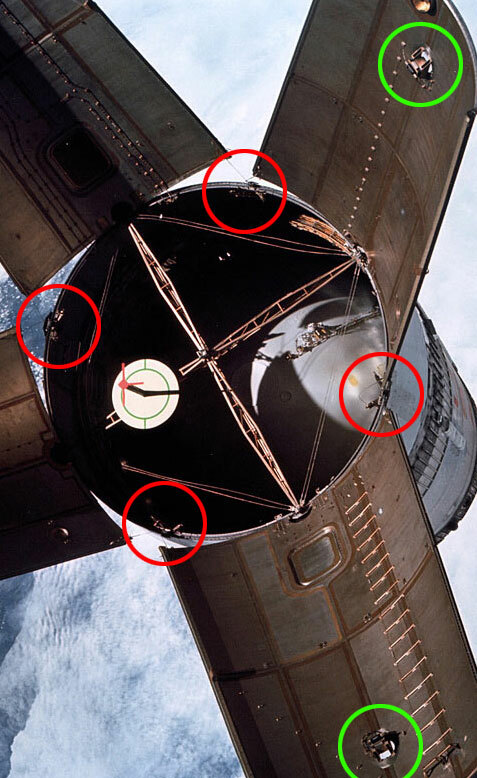 First, I don't think that there was the need for a stabilization system, if any would have been much bigger, provided it should work IN the atmosphere only, obviously, not in space. but regarding the red ones...??? As you see the instruments (?) are different in the various panels. I think that all the colour images here, being from Apollo 7 test flight, probably show something that was not on the Apollo 11 and following missions, perhaps some telemetry system or, giving a closer look, perhaps some kind of mini-engine to propel the panels far away (I feel to see a kind of nozzles there), later discontinued in favour of the pyrotechnic system, or some kind of TV cameras, but I'm very doubtful, and would suggest you to omit these particulars. Moreover I fear that the images we already have, are the only SLA panels interiors available on the web. Last edited by Andrea on Mon, 01-10-07, 18:55 GMT, edited 1 time in total.